The US navy on Wednesday sacked two top commanders from a warship that was involved in a deadly collision with a tanker off Singapore, citing a “loss of confidence” in the officers. 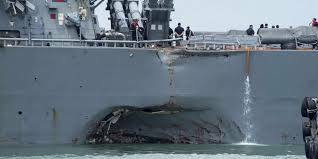 On August 21, the guided-missile destroyer USS John S. McCain smashed into a tanker as the warship headed to Singapore, tearing a huge hole in the hull. The collision killed 10 sailors and injured five others. That incident came after another destroyer, the USS Fitzgerald, collided with a Philippine-flagged cargo ship off Japan in June, leaving seven sailors dead. Commanding officer Alfredo J. Sanchez and executive officer Jessie L. Sanchez of the USS John S. McCain “were relieved of their duties” on Wednesday, the Pacific-based US Seventh Fleet said in a statement. Two non-deadly incidents also occurred this year — in January, the USS Antietam ran aground near its base in Japan and in May, the USS Lake Champlain collided with a South Korean fishing vessel. Following the USS McCain incident, the Navy sacked the commander of the Seventh Fleet, and several other officers and enlisted sailors have been relieved of duty or reprimanded.